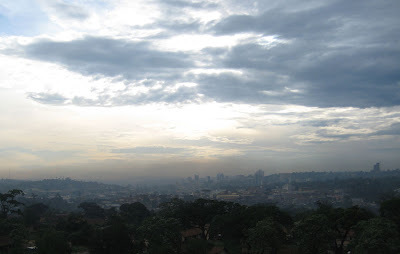 This is the view of downtown Kampala from my room, which is on the 5th floor of a shopping complex. Wonderful. These are the three things I think a lot about these days, and they're more related than you might think. In the latest NYRB, Jerome Groopman (article not yet available online) reviews two new books on the intersection of medical science and sleuthing. This statement often comes as a shock to most people when I say it: most medical doctors are not scientists. They are detectives and artists. Not only do most not participate in medical trials, but if you ask your medical doctor about the trials and studies the drugs they are prescribing are based on, few can tell you any details and will find the questions silly. Most see their profession as determining the problem, and after that, they simply follow the rule: when faced with x problem, prescribe y, then observe more and, if faced with z, prescribe some w.
Not that there's a problem with that. Division of labor works well here, and few people could keep all of this information straight in their head. Groopman has done a fine job in the past exploring the detective nature of medical doctors, and he deserves to be read for that reason. He also has written about the problems modern medicine faces for doctors to spend the necessary time on each patient, and for this argument he falls short. In the NYRB article, Groopman laments the dwindling time doctors have to spend on patients, in large part becuase of the way their time has, in his mind, become commoditified by the system. Each minute a doctor spends with a patient is billed, and so most are forced to spend just enough time to figure out whats wrong, or close enough to it, then move along quickly. Groopman is correct that doctors time has been commodified, but its not the system he should be blaming, its doctors. America pays its medical doctors far more than anywhere else in the world, mostly because this is what doctors have demanded in recent years. The commodification of doctors time is because doctors are very expensive, and thats mostly the fault of doctors. But what does this have to do with economic development? The tools that medical science uses are very close to the tools I use in my work: the scientific method, close scrutiny of any claim, a bit of artisty and a dash of detective work. I follow medical studies and, 9 studies out of 10 that I see quoted in the newspaper, I look up and observe the methodology closely. Many studies make more errors than you might think, and a close scepticism of any reported result is important. Even more importantly though, the tools of medical science have a lot to teach economists still. The NYT has a great video about the consequences and causes of an E Coli outbreak recently that left one woman paralyzed. I've blogged previously about the lack of proper government oversight of meat producers, and this is more evidence that we need more regulation. I recently finished reading Julius Ceasar's commentary on The Gallic War which was so interesting I quickly read through Goldsworthy's excellent biography Caesar: Life of a Colossus . Its one of the most interesting and balanced portrayals of the man ever written. For anyone interested in Roman economic history, I also suggest this collection of research: The Ancient Economy , or a new post over at Brad DeLong on the end of Roman agriculture slavery. No surprise, John Grisham is no fan of literature. One of the greatest minds of the last century, Alan Turing, finally gets an apology from the UK. The politics of journal editing. (HT to MR). I had no idea about a dam catastrophe in Russia. Boston Globe has some amazing pictures.